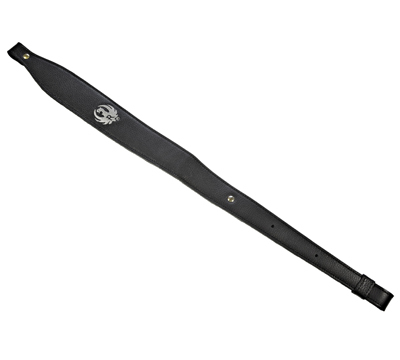 Black garment leather cobra rifle sling with suede lining and loop adjustment. 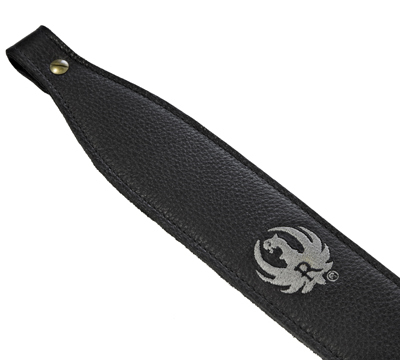 Features include loop ends that fit 1" swivels, Chicago screws, sling adjusts from 29" to 37", and embroidered Ruger logo. Made by Levy Leathers. If used on the Ruger® Mini-14® or the Ruger® Mini Thirty®, expect a snug fit. I just got this for my Mini 14 ranch rifle. It does have a snug fit up front, but after a couple minutes I was able to work the strap through. The leather is great quality, it is very soft. Its a handsome sling for a handsome rifle. Would recommend. This sling was great up until one of the barrel screws backed out on the top loop causing my gun to land on the access road I was on. I would highly recommend using a thread-loc on these screws once you have it adjusted to your fit. Receive my sling yesterday. Tried putting it on my new Mini 14. It has been said here that its hard getting it in the front loop. It sure is. Its thick. So, at first I tried pinching the end of the strap with a pliers. Didnt work. So, my next move was to pinch the whole end up about 2 inches. That worked. Got it started and the rest went right in. I dont think Ill ever remove it. Bottom end, no problem. Great sling, very well made. If you look at the Levys web site you will see that most of their other straps, etc are much more expensive than this one from Ruger. If you want a sling, get this one you cant go wrong with it. Super nice leather surprised by how good the quality is. Used this on my new mini 14. The snug fit they talk about in another review is how it fits on the factory clamp. You have to squish the end of the leather to get it to fit. Only a problem on the barrel clamp. Once in works awesome. I installed this sling with Ruger swivels on my 77/357. The product exceeds expectations. It looks great & is extremely comfortable. It adjusts perfectly to my frame. I intend to order this sling for my AR-556. Highly recommend. Thank you Ruger. I see where Ruger has listed this sling will not fit the Ruger Mini 14? I have purchased 3 of these black cobra slings for my Ruger Mini 14, Ruger Gunsite Scout Rifle 308, and for my 10/22 International. They all fit perfectly well on all 3 rifles. The leather is soft and supple, made by Levy in Canada. Very comfortable sling. Great looking on the bone grey stocks. Nice embroidered Ruger Logo. Quality Product! Thanks Ruger! Wont fit the new 500 series 300 blackout! The only part of the sling I question the quality is the tension loop at the bottom. As far as the rest of the sling it looks nice. However because Ruger chose to make the front sling loop only wide enough for a paper thin sling, this sling is far too fat to feed thru the loop. Rear loop is fine. It will work on an early 80s model. I have to wonder why ruger has to make adding accessories to the Mini-14 such a chore while the AR is easily accessorized. You cant even add one of the para-cord sling or buy a magazine at a reasonable cost! Why youd make a loop on the 300 BLK mini 14 this small Id like to know! It looks great and it fits my Mini 14 perfectly! I bought this for my Mini 30 and it fit perfectly. No problems. Beautiful well made product. Took a chance and bought it for my 581 SS Mini-14 Rancher. Fits perfectly and looks GREAT! Love this sling will be ordering another soon. Bought this sling for a new Ruger American chambered for .308 Win. When it arrived I was amazed at how flexible and comfortable it is, no break-in or special treatments, Glovoleum or the like, necessary. I will be purchasing another for a second Ruger American shortly. Highly recommended. This is a very high quality rifle sling. When I received it, I was shocked at how nice it was. Considering the price, I thought I might get a Chinese made piece of junk. This sling is genuine leather with a suede backing and is made by Levi Leathers in Canada. I am very satisfied with this sling. Thanks Ruger, this really compliments my Ruger Gunsite Scout. This sling is attached to my Ruger American in 30-06. Fits great, works great and looks good. It is comfortable and very well made. Love it!